First of all, Kix is not a “hair band”. Lets be very clear… Kix had good fashion sense, but they never pumped their hair to over-inflated heights. Kix relied on their riffs and snarky lyrics. They were a more polished and better version of AC/DC with Bon Scott. They knew how to write songs with more hooks than a bait shop. Sure, Donnie Purnell was the chief songwriter in the band, but hey… it takes a lot of cooks to prep such a delicious Kix entrée. The main thing that I love about Kix is dual guitar attack of Brian Forsythe and Ronnie Younkins. Both of them are more than adequate lead guitarists, but when it comes to rhythm guitar I can only think of a handful of other combos that allow the song to dictate what is played over the egos of the guitarists. The interplay between the two guitarists is a beautiful thing to behold in your ear canals. Forsythe and Younkins lay back and let the music do the talking. They are fantastic to watch in a live setting. You see them trade off licks while the drummer and bassist hold things down as Steve Whiteman lets go like blonde Peter Wolf. I’ve been fortunate enough to see them in small clubs and on stage in the Greensboro Coliseum before a sellout crowd. And every… single… time… Kix brought it! Not only are Kix in my top 5 all time favorite bands, but their ‘Midnight Dynamite’ tour stop at the old Baity’s Music Garden in Winston-Salem ranks right up there with the Queensryche, White Zombie, Gwen Stefani, and KISS shows that I’ve seen. And they’re still great! They even have recent live and studio albums out. 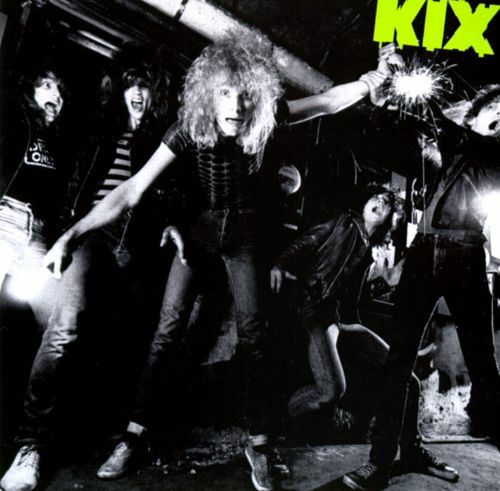 This first Kix album is a mixture of hard rock, power pop, new wave, and punk rolled up into one tight little power plant. And when you listen to it, you can imagine Whiteman prancing around the stage like Mick Jagger on crank while the rest of the band stands back pumping out rock and roll so electric that they could power a small town. Another cool thing about Kix… Whiteman and Purnell are West by-God Virginians that became “city goats” in Baltimore. Kix are to Baltimore what KISS is to New York City. What Nirvana are to Seattle. What Motley Crue are to Los Angeles. Another interesting thing about Kix is Donnie Purnell, the chief songwriter through most of their run. After working to get the band to world supremacy, the aforementioned Nirvana put a knife in the heart of hard rock and roll with their ‘Nevermind’ album, and Kix were quickly forgotten. All the bands associated with even a hint of hairspray were wiped off the landscape. That included Kix just as they broke the top ten on the Billboard Hot 100 chart with the song “Don’t Close Your Eyes”. The song is one of my least favorites, but they were finally being noticed. And then they were gone. No one wanted ‘Hot Wire’ as Nirvana, Stone Temple Pilots, and Soundgarden were purging the hard rock music scene of the likes of Warrant, Ratt, and Poison. And I believe that crushed Purnell. He gave one underrated and under-produced album on CMC International a shot and just simply checked out. From the rumors that I heard, Purnell went back to construction jobs in West Virginia. And when Kix reformed, he wanted nothing to do with it. Was he soured after working so hard to get the band to the heights of the charts only to be slapped in the face by the fickle American music fans? I think so. The guy put a LOT of work and effort into the band only to finally receive the love and then they were kicked to the curb like one of Gene Simmons’ many sexual conquests. Although I wanted to put ‘Midnight Dynamite’ on this list, I felt that they’re first album should be represented. There’s not a bad track on the album. From the opening of “Atomic Bombs” to the closing to-this-day concert staple “Yeah, Yeah, Yeah” you get the exact profile of the band. There are songs to rock you, songs to satisfy that sweet pop music tooth, and songs that are works of songwriting beauty. And to be quite honest, Kix doesn’t have an album that I wouldn’t recommend. They put out a lot of quality and they’re still doing it.